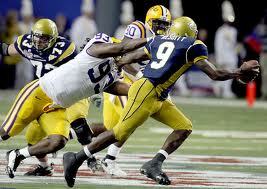 Williams has the potential to be a feature back in the NFL, I just have quesitons about his durability and toughness. 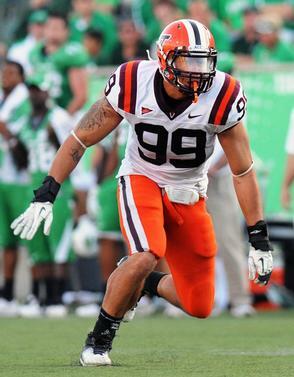 Positives: Williams has good size, athletic ability and has been very productive in his career at Virginia Tech. He shows consistently good vision, has a good burst to hit the hole and get to the second level, and doesn’t waste steps in the backfield and dance around before hitting the hole. He plays North-South more than East-West, and he shows some power when running which I like. He isn’t what I would call a “power back” but he will lower his shoulder to run over people and fight for extra yards. He also has good leg drive to gain extra yardage after initial contact. He also has enough speed to get significant chunks of yardage in the NFL, and he shows good patience as a runner to let his blocks set up. He really does have impressive burst and change of direction ability for his size as well. He has a general good feel as a runner, and he consistently falls forward for additional yardage when fighting at the end of a run. He also shows pretty good hands out of the backfield, and should be an effective receiver in the NFL. Additionally he shows some effort and ability as a pass blocker which will be critical for whether he is viewed as an every down back in the NFL or not. Negatives: Despite Williams’ impressive production at Virginia Tech I have a question about his speed. I don’t think he has the straight line speed to get the edge consistently in the NFL, and I think he is going to be more of an inside runner. I think that’s where he was most effective in college also, but the threat of him bouncing runs outside for significant yardage will be there in the NFL. He also won’t be consistently ripping off huge runs for touchdowns in the NFL because he doesn’t have elite straight line speed. I have questions about Williams’ durability also because he tends to get nicked up and also missed some time this season because of injury. At times when there is significant penetration he will dance too much in the backfield, and sometimes he will go backwards trying to evade the defenders which is definitely not going to fly in the NFL. He could also improve his hands and his pass blocking which he should do with quality coaching at the next level. Overall: I think Williams is a very impressive player. I just wonder if he is durable enough to be a feature back in the NFL. I think he has that ability even though he doesn’t have a lot of power as a runner, but if he consistently gets nicked up and has to come in and out of a game regularly like he did this year at Virginia Tech then it will be hard for him to hang on to his feature back role. At the start of his career I think he will be just fine as a complement to an established starter, but it will be up to him, his toughness and his luck with injuries when it comes to whether or not he will be the feature back. He definitely showed that he has that ability as a freshman and at times he showed it as a sophomore, and I think that if he can stay healthy he has the ability to be a very effective back in the NFL. Especially if he can improve his hands and pass blocking which would make him a very well rounded back. Projection: Early-mid 2nd round. Williams deserves late 1st round consideration in my opinion but running backs tend to slide a little bit, so I think he will end up going somewhere in the first 40-50 selections come draft day. Here are some positional rankings that I started working on yesterday. I have 10 players for most positions excluding fullback, kicker and punter. Now that I have these rankings churned out I am going to work hard to watch all of the guys I have on this list and churn out scouting reports on them over my upcoming winter break. But until then, enjoy my rankings! Let me know what you think! I took some notes on the game and I also just had some overall reactions to some players that I paid attention to in the game. Obviously I can’t project them accurately after watching them live one time, but I have a feeling for some of the players that participated in this game as prospects so I thought I would post some notes on them. Hopefully you all find them interesting! Taylor started off strong but struggled when he was forced to pick apart zone coverage. Tyrod Taylor showing nice zip on his throws and making good, quick decisions on the first drive. He threw an absolutely beautiful pass to the sideline and Jarrett Boykin high pointed it and made a great catch on the sideline. He showed great hands and ability to make a catch in traffic here. I really like Boykin as a NFL receiver. Taylor in shotgun, they brought pressure and Tyrod got out of trouble and extended the play. He’s not really one to stay in the pocket in the face of pressure which makes him hard to project to the NFL. Tyrod has good arm strength and zip on his throws, even when on the run.Tyrod has spent a lot of time scrambling in this game. I like seeing him extending plays and drives with his feet but I wanted to see him stay in the pocket and go through his progressions more. Tyrod really cooled off when GT started dropping 7 or 8 into coverage with a spy on him. He was forced to make quick reads and deliver the ball fast but he would hold the ball too long and turn it into a broken play by scrambling. There were a few plays where he literally had ALL day to throw but he did not look effective trying to beat GT’s zone coverage at all. It’s good that he can extend plays, but he has shown a strong tendency to hold onto the ball too long instead of delivering it in rhythm. Williams looked like his pre-injury self at times in this game, but I wonder if he will declare because of his "down" year as a result of injury. Ryan Williams showed flashes of his former self tonight. He looked a little big to me on TV, I’d be interested to see if he is at his normal playing weight. Maybe that is just me. He looked quick through and showed some nice vision and good quickness/burst. I want to see him run inside more but obviously I haven’t seen much of him this year because of his hamstring. From what I remember he looked like a very effective inside runner to me. Darren Evans looked solid, but didn’t look like anything special. He is a hard runner but I’d be surprised if he clocked in at anything under a 4.5 in the 40. He didn’t have a great rushing average but he got what yards he could and he didn’t go down on the first hit. He struggled on the goal line but that was because of the penetration GT’s defensive line was getting, that is on the offensive line. That hurt his average as well. He looks like a mid-round pick to me right now, but that was definitely based off of limited viewing of him. David Wilson definitely looked good to me. He looks like he has a lot of potential as a 3rd down back in the NFL. I’d like to see him catch more passes out of the backfield, but obviously this was a limited viewing of him. But as he gains more experience I really think he could be a valuable commodity when he comes out. He is so dangerous as a return-man, plus he runs the ball effectively… if he develops into a dangerous receiver out of the backfield then he would be potentially as dangerous as C.J. Spiller. He had a huge impact on the game with his rushing touchdown and his ultimately game winning kick off return for a score. Boykin is the best of the trio of Virginia Tech receivers in my estimation. He has good hands and can make tough catches in traffic. Jarrett Boykin looked good to me. He can make tough catches in traffic, he has huge strong, reliable hands and he is Taylor’s most reliable target in my opinion. I really like him as a NFL prospect, but he doesn’t look like much more than a #2 WR in my opinion. He has a lot of talent though and as he improves his route running I think he will develop into a reliable NFL target. Guys with his combination of size, hands and ability to make catches in traffic when high-pointing the ball are valuable. Antoine Hopkins, #56 at DT for Virginia Tech, impressed me last night. He made a few stops right at the line of scrimmage, and coming into the game he had 20 tackles, 4.5 TFL, 2 sacks, 1 pass break-up and 1 QB hurry. He was definitely having a strong game in the middle, and he looks like a nice NT prospect to me and he is only a sophomore. I need to see more of him obviously, but he is definitely on my radar. He is a squatty player at 6’1”, 302 pounds but he had a good game last night to be sure. Rashad Carmichael had a solid game. I didn’t see how well he supported the run against the triple option, but when he was challenged in coverage he gave up a 43 yard completion and then made the game clinching interception later on that same drive. Every corner is going to give up some catches, even some big ones, but I like to see corners that can make a mistake and move on from it and not let one mistake lead to another and another. He was out of position on the play when he made his interception but he closed on the ball quickly and showed an impressive burst to close and he turned his head around just in time to make the interception. He is having a strong statistical season, but I really think he could be a great corner in a primarily zone scheme. I haven’t seen him enough in man coverage to evaluate him well, but he strikes me as a very dangerous corner in zone because of his ball skills and because of how well he closes on the ball. Hosley has a lot of talent and he is a dangerous punt returner. Jayron Hosley looked good to me as well. He is only a sophomore but he has a lot of talent. He is having a good season statistically but really he has had one incredible game against NC State in which he had 3 INT’s and 4 passes deflected. He is a talented player though, and I liked what I saw from him as a returner. He is really quick and he can make a lot of guys miss once he gets a block or two. He has to be more consistent in coverage because he likes to gamble from what I can tell, so that means he will give up big plays but also make them. I am excited to continue to watch him mature because he has 1st round talent without a doubt. I liked what I saw from senior safety Davon Morgan, #2 on Virginia Tech. He looks much bigger on TV than he is listed as he is listed at 6’0”, 196 pounds. I would have guessed that he was 6’3” the way he looked on TV. He is having a productive season from a tackling standpoint, but he made a nice play on the ball in the game last night to make a game-changing interception. I think at worst he will be a solid special teams player in the NFL, but I haven’t seen enough of him to know how reliable of a tackler he is and to see how he is in coverage. Georgia Tech is not a good team to evaluate DB’s against. 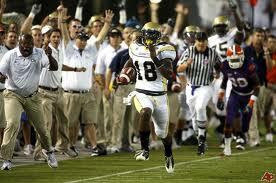 Stephen Hill, Georgia Tech’s best receiver, did not really impress me much last night. He seems to be more of a finesse player than Demaryius Thomas was, but he did not make a catch in traffic last night that hit him in the hands and that was disappointing. He was also hurt on the play, and I’m not sure he returned for more than a few snaps the rest of the game. I would have liked to see more toughness than that, but I definitely want to see more from him before I will be sold on him. I don't know how well Anthony Allen will transition to the NFL because I question his vision as a runner. Anthony Allen had a productive game, but Georgia Tech’s triple option offense makes it hard for me (and a lot of other people) to evaluate their running backs. Allen is filling in for Jonathan Dwyer this year, and he is doing a good job of it, but the position does not seem to require the vision that a typical running back would need since the quarterback is the player who has to read his keys and decide whether to hand the ball off or keep it. If Allen gets the ball he just runs to the hole and gets what yardage he can, he doesn’t have to have great or even good vision to be effective. He has ability, but I’m not sure he can effectively translate to a pro-style offense at running back. Dwyer has not made an impact on the Steelers at all this season, and after falling to the 6th round I don’t think Allen will be facing a very favorable panel of suitors when the draft finally rolls around. Dwyer has not transitioned well to the NFL, so there isn’t a lot of evidence to suggest that Allen will. Nesbitt will have a tough transition to the NFL, but I think he has the size, athleticism and vision to transition to RB in the NFL at some point. Josh Nesbitt is an interesting prospect. He absolutely will not be playing QB on the next level, but today one of my good friends asked me if I thought he might be able to play running back. And honestly, I think he has the potential to do so. It would require a good deal of patience on someone’s part, and he might have to take part in a couple of mini-camps and training camps before he finally got a roster spot, but he has good size at 6’1”, 217 pounds and he packs some punch as a runner. He has good vision and he reads keys well or else Georgia Tech’s offense would not be nearly as effective as it is with him at Quarterback. The transition will be a big one, but as a late round pick I definitely think he will get some consideration. He has the size, the athleticism and the vision to contribute at running back in the NFL, so the only question will be how well or quickly he can transition to the pro-style offenses in the NFL. Hopefully you guys enjoyed the notes, thanks for reading! I liked a lot of what I saw in this game and I was glad I rewatched it and didn’t just pay attention to one player like I had in previous viewings. First and foremost I was concerned with watching Tyrod Taylor to get a feel for how far he had come as a QB since he got the redshirt taken off of him a couple years ago. Overall I was impressed, because he has really come a long way as a passer in his time at Virginia Tech. 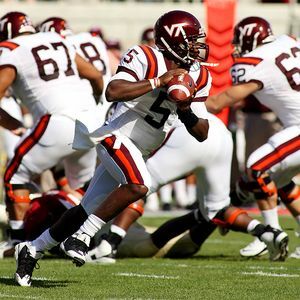 The comparisons to Mike Vick are inevitable because they are both scramblers, they both play at Virginia Tech, and both are arguably as good at running as they are at passing (if not better at times in their careers). Tyrod Taylor showed better accuracy, timing and patience from the pocket in this game. However, I think Tyrod is much more advanced from a passing standpoint than Mike Vick was during his time at Virginia Tech. I took particular note of every throw he made in this game, and he flashed the ability to use his eyes to keep safeties and DB’s honest before delivering the throw to an open target two or maybe three times out of his 18 pass attempts. That might not seem like an impressive number, but I know for a fact that there are QB’s who get hyped up as 1st round picks who can’t and haven’t ever done that. Especially those that operate out of a spread offense. But this was exciting to see because I had never really noticed Tyrod doing this before. I don’t know if I just wasn’t paying attention to it or if he wasn’t doing it, but regardless I was excited to see him doing this. That is a NFL skill. I also looked over my notes (I took eight pages of them in a word document while I watched this game) and counted up his good, great and bad throws. 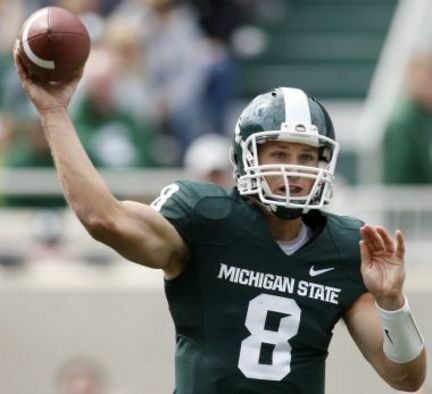 He totaled seven good throws, one great throw and three bad throws. There were a few passes that were neither here nor there, so I didn’t include them in this evaluation. He threw one interception in this game and it was a bad decision, but I was impressed with his ability to move past it and come out in the 2nd half and play well. All three of his bad throws came in the first half, and he looked very good in the 2nd half. He threw some absolute frozen ropes down the seam in this game, and showed the ability to go through more than just one or two progressions a time or two. He will still stare down his primary receiver or one side of the field but he does a better job of using his eyes to his advantage than he used to. He showed great zip and arm strength which we all knew he had, but he also showed improved accuracy in this game. He missed high with a throw or two during the course of the game, plus he threw the interception which was just a bad throw into coverage, but other than that he was accurate with the majority of his passes. That was good to see. But perhaps just as importantly as his passes being delivered accurately the vast majority of his throws were delivered in rhythm and on time as his receivers were coming out of their breaks. That impressed me as much as anything else. Seeing him make good reads, delivering accurate throws on time (and from the pocket no less) shows that he is really growing as a passer. 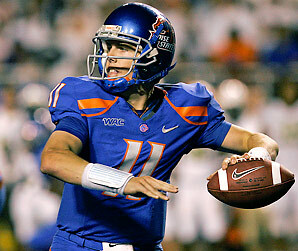 However he had a few bad throws and he still doesn’t do a great job of going through his progressions. I counted twice he dropped back and scrambled unnecessarily before he went through all of his progressions. He has great mobility and does a great job of picking up yardage with his legs to extend drives, but he still gets himself in trouble every once in a while when he doesn’t buy time in the pocket and stay patient to go through his progressions. He has come a very long way in this department from what I can tell however, so I am excited to see how he does in this regard as a Senior. Overall I was quite impressed with Tyrod. The majority of his throws were good, accurate passes and he looked much better throwing from the pocket than I gave him credit for. His release looks clean and just like Vick he can flick his wrist and the ball will go 60 yards. But his accuracy has improved a lot and his passes are being delivered with much better timing and rhythm than I had ever seen from him before. If he keeps progressing like this I think he will be drafted as a QB and will make a roster as a developmental #3 without a doubt. Williams got stronger as the game went on before leaving with an ankle injury with the game well in hand. Naturally I was very impressed with Ryan Williams in this game. He started slow in the second half, but for all the ridicule Bryan Stinespring gets for his predictable and sometimes pitiful playcalling from Virginia Tech fans he did a good job of mixing up the way he was getting Ryan Williams the ball in the 2nd half and it got him more running room and he made the most of it. Williams has good vision, great patience for such a young running back, good quickness and burst to hit the hole, he runs hard and runs through arm tackles easily and has the strength to push the pile and get consistent yards after contact. But he can also make guys miss, turn on the jets and outrun a lot of defenders. He’s a very, very good running back. He seems to have ok hands out of the backfield, but that is something he will need to work on as far as I can tell. And like all young RB’s he needs to continue to work at his pass protection. I wouldn’t be surprised at all if Williams had another great year and declared for the draft as he is a redshirt sophomore. If he did I would expect that he would be a 1st round pick without a doubt. He is as good as advertised, that’s for sure. I took notes on all three of Tyrod’s primary targets in the passing game: Dyrell Roberts, Jarrett Boykin and Danny Coale. I liked what I saw from all three of them to be perfectly honest. Roberts has the most potential of the trio because he has good size at 6’1”, 196 pounds but he has speed to burn with 4.42 timed speed. He can really get deep, and VT does what they can to get the ball in his hands. He didn’t have what I would call a “good catch” in this game, meaning he didn’t make a nice catch away from his body with his hands. He had two catches in this game and he let both of them get into his pads, which is not something I like to see from WR’s. This is a very bad habit and it can lead to a lot of drops, especially in the NFL. Hopefully he will work on catching the ball with his hands this summer, because if he can shake that bad habit I think he could be a much more consistent threat. With his size, speed and playmaking ability he just needs to work on his hands and his route running ability before he can take off. He has a lot of potential, but he still needs some work in my opinion. Roberts has a lot of potential, but needs to catch the ball with his hands more consistently and refine his route running. I really liked what I saw from Jarrett Boykin though. He was a consistent threat for VT this year and he showed the ability to catch the ball away from his body a couple times in this game, which was nice to see. He can also get deep even if he only has deceptive speed (he was timed at 4.54). He showed this speed when he got behind Tennessee’s secondary right before the half and pulled in a 63 yard pass from Tyrod Taylor that set up a field goal as the first half came to a close. He had four catches in this game, and at least two of them where fundamentally sound catches with his hands. The deep ball at the end of the half looked like it got into his pads a bit, but there was one other play that he let the ball get into his pads too. But what is important is that he has shown he can catch well with his hands, he just needs to work to shake the bad habit of letting the ball get into his body. This is absolutely do-able, even if you have to work on it once you get to the NFL. Personally of the three receivers on VT and the two receivers I liked on Tennessee I was most impressed with Boykin, so I am really excited to see how he plays as a Junior. I also took notes on Danny Coale when I could, but he only had one catch in this game (though it was a big one for 42 yards) so he didn’t get targeted often. Tyrod was throwing the ball to him when he threw his interception, and Coale had run an effective crossing route. If Tyrod had put more air under the ball and led Coale downfield behind the safety (who made the interception when he broke on the bullet he threw) Coale may have made another big catch. I have been told many times that Coale has great hands, and even though he only had one play to make in this game he made a terrific over the shoulder grab to haul this in and set up a 1st and goal. It was a great throw from Taylor but it was an even better catch by Coale. Hopefully he gets some more passes thrown his way as a junior, but between their fantastic running game and Roberts and Boykin competing for passes, I understand why Coale is flying under the radar. I think he has what it takes to make a NFL roster though. But I need to see him more obviously. Boykin is the best of the trio of Virginia Tech receivers in my estimation. I made an effort to watch Blake DeChristopher, Virginia Tech’s RT, but he was fairly unimpressive to me. Whenever I would watch him he would look decent, but nothing special. He would get bull rushed but reset himself and stop the DE’s progress, he would do an ok job of making a cut block, he would do an alright job of walling off a defender in the run game, but it was never anything that really impressed me. I’ll be interested to see if he plays any better as a junior, but I am not sold on him at all right now. 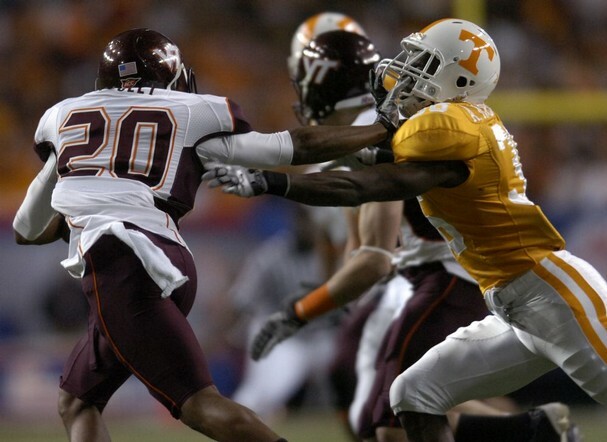 There were a few players I paid attention to on VT’s defense. I liked what I saw from Jayron Hosley (who is a redshirt sophomore cornerback this year), Lyndell Gibson (who is a sophomore middle linebacker this year), Barquell Rivers (who is a junior who plays weakside linebacker), John Graves (who is a junior DT) and Rashad Carmichael (a redshirt senior CB this year). I also looked at Chris Drager when he was in. He is a redshirt Junior DE this season. Hosley impressed me though he wasn’t in a whole lot. That isn’t extremely surprising considering he was only a redshirt freshman this past season, but when he was on the field he was active. He showed good burst, he looked good in zone coverage (I didn’t see him in man much if at all), and showed impressive ability to read the QB’s eyes and make a break on the ball. He was half a step away from coming away with two great interceptions in this game, and I think one or maybe even both of them could have gone back for a touchdown. As he gets more comfortable and gains more experience I really think Hosley is going to be a playmaker. He also returns punts for them, and he fielded one near the 5 yard line and I thought “Oh no, here’s a mistake by a young guy” and he made one guy miss and all of a sudden he was at the 25 yard line. He tried to make a really sharp cut and lost his footing after a 22 yard return, but if he had made that cut he probably would have been gone for a 95 yard touchdown on that punt return. He has a lot of speed, quickness and burst, plus he looks good in coverage. He also did a good job disguising a blitz off of the edge and leveled Crompton for a sack. Overall I really liked what I saw from Hosley and can’t wait to see him in the starting lineup as a sophomore. Hosley has a ton of potential, and nearly came away with 2 INT's in this game. In addition he was one cut away from a 95 yard punt return TD. Lyndell Gibson also looked good to me. He is the starting MLB for Virginia Tech, but it wasn’t that way for the entire season. He got the starting nod pretty late in the season, but he started the last five games (including the bowl game) and the Hokies won every game. He really seemed to stabilize the defense according to what Bud Foster had to say about it. Gibson showed pretty good instincts and even though he is a little undersized (5’10”, 230 pounds I believe) he played well in this game. He seems to read plays well and did a good job of fighting off blocks from an experienced Tennessee offensive line all game. I liked that he shed blocks pretty well but also had the fluidity to avoid them and make plays at the line of scrimmage. I am also not sure I saw him miss a tackle in this game. He also looked solid in coverage, though he tried to jump an underneath route to Luke Stocker (Tennessee’s TE) but Crompton held onto the ball and got it to Stocker after he came open again. Overall I liked what I saw, and it will be interesting to see if he keeps the starting job as a sophomore. Hopefully he does and he continues to progress. Barquell Rivers had a decent game, but he had some ups and downs. He missed a couple of tackles, but he also made some nice stops up at the line of scrimmage, and had one or two tackles for loss. I didn’t see him in coverage often, but I never saw him get beat. Overall I didn’t have my eye on him that much, but every once in a while he would show up for better or for worse. It will be interesting to see how he does next year, but I can’t say I am sold on him at this point. Gibson helped solidify the defense once he was inserted into the starting lineup for the last 5 games of the season. I learned earlier today that the VT-Tennessee Bowl Game was John Graves’ first significant playing time of the season (Shout out to Andrew Thompson for that) so that might explain why I was relatively unimpressed with him. For one you can tell that VT experimented with him at DE because he only weighs about 270-275 pounds, but he just did not have a great game. He definitely had some highlights as he did a great job of splitting a double team, swatting away Hardesty as he tried to block him and sacking Crompton while forcing a fumble. He later recovered a fumble after Worilds sacked Crompton late in the 4th quarter. But for the majority of this game he was getting double-teamed and washed out in the run game or stonewalled in the passing game. He didn’t seem to quit despite all of this, which is a good sign for his motor. However, the fact still remains that he needs to get up to 285 at least before he is going to hold up well against the run at all. He was simply overpowered in the run game by Tennessee’s veteran offensive line, so he needs to put on some weight before next year to help him get stronger at the point of attack. He could also stand to improve his hand usage and his moves to get off of blocks (such as the rip, swim and spin moves most players work on). He has some potential because he gets off the line pretty quickly, seems to have a solid motor and definitely has some athletic ability. But to make the jump from a DT/DE ‘Tweener to a quality starting DT he is going to need to get stronger (especially in the lower body) and improve his hand usage. I will be looking forward to seeing how he does with that in this coming season. Carmichael has a lot of potential and seems to have a great work ethic, which could mean a great senior season for him. Rashad Carmichael had an alright game against Tennessee. He had an interception that ended Tennessee’s first drive of the game when he was in zone coverage (it looked like VT was running a Cover-3, so Carmichael had a deep 1/3). He was just reading Crompton’s eyes and when he threw it he broke on the ball over the top, but it was overthrown so it went right to him for an easy interception. He didn’t look especially good supporting the run, but he seemed to play well in coverage. I never saw him get beat deep, but VT seemed to be running a lot of zone in this game. He is considered a very good corner by most, as he is coming into his Redshirt-Senior season, but he didn’t look like a great corner in this game. Obviously next year will be critical for him, but I am not sold on him yet. I did read a great article (which can be seen here: http://ncaafootball.fanhouse.com/2010/04/20/virginia-techs-rashad-carmichael-is-hooked-on-video/) about his dedication and film study which really made me like him. He seems to be a great kid, a good mentor (judging by his volunteer and internship work) and you always love to hear about a college player being so dedicated to film study. If his film study is any indication, he should have a great season next year. I also took brief notes on Chris Drager when he got in the game. He usually only got in on passing downs, but he showed what he could do when he got playing time. He made a nice play on a run on 3rd and long when he beat a TE’s block (after getting combo-blocked initially by Chris Scott, Tennessee’s mammoth LT) and stopped Hardesty for no gain on the play. He showed some burst off the line of scrimmage, and if VT is going to have a good defense this year they are going to need Drager to step up to help replace some of the great pass rush that they lost when Worilds left for the draft. Hopefully you enjoyed that. I apologize for the ridiculous length. As I said I took eight pages of notes on this, so there was a lot to cover. Part 2 will focus on the Tennessee players that I took notes on. Thanks for reading! Hopefully it wasn’t too much to read.